This homemade bathroom cleaner with vinegar, baking soda, castile soap and essential oils is the best DIY all natural bathroom cleaner! It’s made without bleach, perfect for cleaning showers, toilets, bathroom counters and soap scum safely and effectively! We’re back with another DIY natural cleaning recipe: homemade bathroom cleaner! 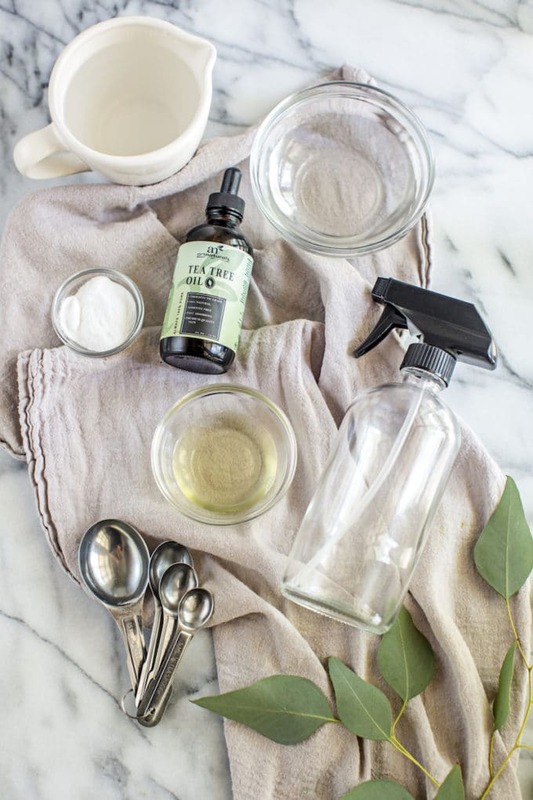 We’ve been over this before, as there are so many reasons to make your own cleaning products. 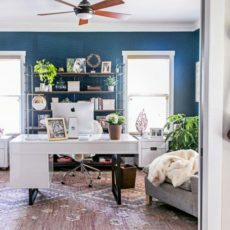 It’s safer (scroll down for the truth about toxic chemicals in store-bought bathroom cleaners), it lessens your chemical exposure, it’s better for the environment, and it’s SO easy and actually fun to do. 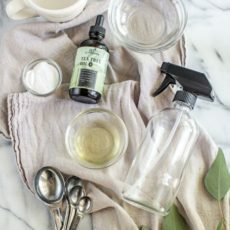 Why wouldn’t you make your own cleaning products?! Plus, by making your own natural cleaning products, you’re voting with your dollars, sending a message to companies who use toxic chemicals in their products that it’s not okay and we demand more transparency and safety! 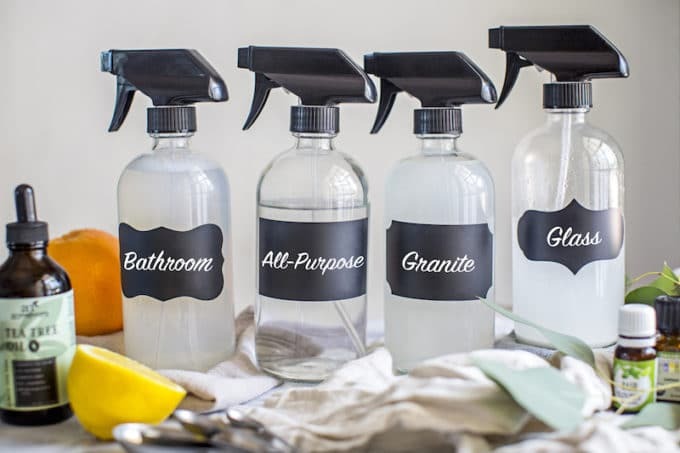 AND, AND, AND… If those reasons aren’t enough for you, consider just how much cheaper it is to DIY cleaning products. If you care at all about saving money, you need to be making your own bathroom cleaner (and all cleaning products!). I mean, come on! At just over a single dollar to make an entire bottle of bathroom cleaner, you really can’t afford not to make your own cleaning products. Did I mention this recipe takes less than 2 minutes to make? Once again, it’s as simple as pour, stir, spray and that’s it. Seriously. 3 steps, and the last one is the actual act of cleaning. If you have 2 minutes to spare, shake this recipe up and pat yourself on the back for being such a far out frugal freddy! Related: The best natural store-bought cleaners for those who would just rather pay someone else to do it. Some days, when I’m writing these stories and researching the chemicals that are found in common store-bought products, the task isn’t as easy. Some products just aren’t as dangerous and toxic. But when it comes to bathroom cleaners, my job of exposing the negative, harmful products on the market is so easy it makes me want to cry. And not happy tears. Of the most popular store-bought bathroom cleaners on the market (that would be Clorox, Scrubbing Bubbles, Lysol and Tilex), every single one of these products is rated an F (the most dangerous score) by the EWG. This is bad, people. So very bad. An F rating means the product contains significant hazards to health or the environment or poor ingredient disclosure, meaning brands don’t disclose their full ingredients list. HUGE RED FLAG. If the company won’t even tell you what’s in it, do NOT use it. Ammonium Chlorides: There are a lot of different versions of ammonium chloride in these cleaning products (none of which I can pronounce), but the important thing to know is that the EPA has concluded that this substance poses a high risk for human health. It causes asthma in otherwise healthy people and reproductive toxicity in animals. Pass. Butoxydiglycol: It’s hard to believe a chemical with evidence of respiratory harm, cancer and developmental/endocrine/reproductive effects is allowed into the products we use in our homes. But somehow butoxydiglycol is. In addition to pulmonary and respiratory harm, this chemical also causes serious eye irritation, has moderate acute toxicity to aquatic life and is riddled with impurities that are known to cause cancer, reproductive toxicity and genetic defects. Really? Please say no to any products with this chemical. Hydrochloric Acid: Not only does this dangerous chemical cause severe skin burns and eye damage, it’s also toxic if inhaled, causing pulmonary edema, asthma, respiratory irritation, skin irritation and eye corosion. All of this before you even consider that all of these store-bought bathroom cleaners also contain fragrance, another hormone disruptor and asthmagen with links to skin irritation, allergies, nervous system effects and acute aquatic toxicity. Fortunately, this recipe for homemade bathroom cleaner will have you cleaning showers, toilets, bathroom counters and soap scum just as effectively (if not more!) without any of the negative side effects. 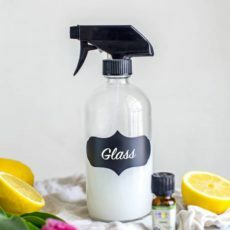 Rather than using ammonia, bleach and other toxic chemicals, this homemade bathroom cleaner is made with vinegar, baking soda, castile soap and essential oils. It’s all natural, made with ingredients you likely already have in your pantry or medicine cabinet and I swear to you, it is SO effective. Vinegar is hugely disinfecting, killing bacteria, like salmonella and E.coli. It’s also excellent at preventing mildew when sprayed on shower walls. To use this bathroom cleaner, I spray it on the surface, let it sit for a minute and then use a bristle brush to scrub it clean. Meanwhile, baking soda is an awesome air freshener as it neutralizes odors (remember how you put a box of it in your fridge to keep it smelling fresh?). Plus when you combine a base like baking soda with an acid like vinegar, they neutralize to make water and sodium acetate, which then acts as an abrasive that works to scrape away stubborn residues. That being said, for really tough bathroom issues, it can be more effective to use baking soda and vinegar separately, as they don’t neutralize each other as they do when mixed together. So follow this exact recipe, but leave the baking soda out. Instead, apply the baking soda directly to the mold/mildew/soap scum/stain and allow to sit for a few minutes. Then spray on the bathroom cleaner and allow to sit for a few more minutes. Scrub away and reveal squeaky clean surfaces! Per usual, I rely on essential oils, rather than synthetic fragrance, to scent this bathroom cleaner. Normally, I recommend using crisp citrus oils like sweet orange, lemon or grapefruit or refreshing green oils, like bergamot, eucalyptus and basil. But this time, I’m going for pure Tea Tree Oil, which is naturally antibacterial, antifungal and antiseptic, perfect for heavy-duty bathroom cleaning. But this time, I’m going for pure Tea Tree Oil, which is naturally antibacterial, antifungal and antiseptic, perfect for heavy-duty bathroom cleaning. 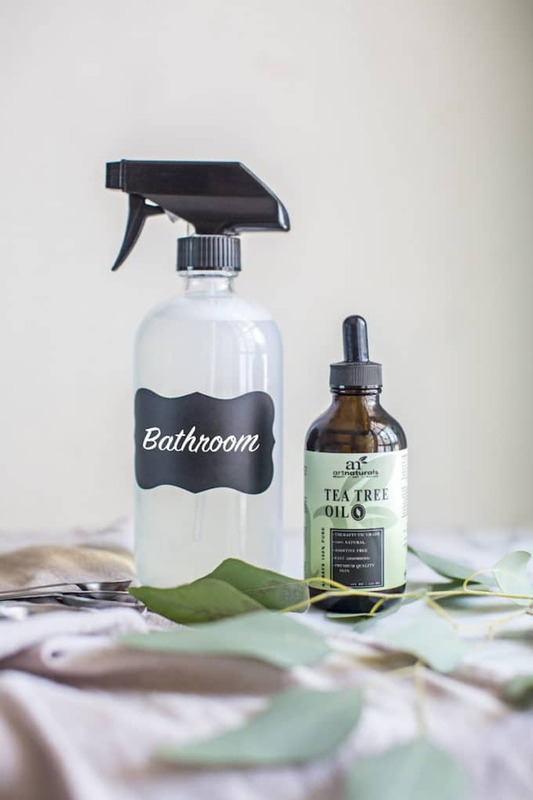 The scent of the tea tree oil and vinegar can be a bit strong at first, but I promise that it goes away after a few minutes and leaves your bathroom sparkling clean with a super fresh aroma. You can use this bathroom cleaner to clean countertops, showers, bath tubs and toilets. It’s pretty all-purpose when it comes to cleaning bathrooms, including getting rid of soap scum, mildew and mold. This homemade bathroom cleaner with vinegar, baking soda, castile soap and essential oils is the best DIY all natural bathroom cleaner! It's made without bleach, perfect for cleaning showers, toilets, bathroom counters and soap scum safely and effectively! Add the baking soda and warm water to a measuring cup fitted with a spout. Stir until baking soda is dissolved. Add the vinegar, castile soap, and essential oils and pour all ingredients into a bottle. Fit with a spray top. Gently swirl the bottle to mix the ingredients together. Use immediately or as needed. Hi, Thanks for the sharing such an informative article about bathroom cleaning. You explain it like an expert. I never compromise to cleaning my bathroom. After reading this article, I found here some useful tips about cleaning the bathroom. I am going to add these in my list. Keep up with good work. I’d suggest distilled water for these recipes, unless you have filtered water. It’s surprising how bad water is in parts of the US . Thanks for your feedback – totally agree about filtered water! I have a whole house filter in my home and totally love it. I made similiar recipe, guessing at amoynt and mixture. When adding vinegar to water and baking soda just put your hand over the top of the bottle. It does not hurt and the suddsing subsides. Also look at the ingredients in your vinegar. Some are made out of apple and some out of grain alcohol. Ive always heard vinegar made from apples are better for home and family. Just a warning for pet owners, tea tree oil is poisonous to pets. It is a neurotoxin to dogs and cats, both through ingestion and fumes. Perhaps best to choose a different essential oil if you have critters. Yes, true–if they get ahold of the bottle and consume a large amount, it can be toxic, so keep tucked away somewhere your pets don’t mess with, just like with any other cleaning supplies/paints/etc! Is this recipe safe for a marble floored shower? The corners sometimes get a little black mold and I rather not use bleach. Hmm, I think so, but you may want to ask the marble manufacturer or research the type of marble you have to be sure. Also start with testing just a super small corner first. I am wondering about the effect of the borax or the baking soda and vinegar on my septic tank??? I just dumped the recommended enzyme treatment down there two nights ago to maintain the septic tank. Would any of this counteract or interfere with the enzymes? Can you give me a reference I can check? Thanks. Hi Rebecca – That’s a great question! Unfortunately I’m really not familiar with enzyme treatments. I’d encourage you to reach out to the enzyme treatment company you used and ask them about guidelines for this. Hope that helps! I think having both vinegar and baking soda in a solution does not make chemical sense. Vinegar neutralizes sodium bicarbonate into salt (sodium chloride) and water, just like we did in elementary science experiments–those erupting “volcanoes”. Might as well just have castille soap, water, and salt if that’s the case. I modified your recipe by leaving out the vinegar and doubling the baking soda and it worked quite well. I would suggest making this tweak. Thanks for sharing your tips though! Thanks for sharing what worked for you, William! Vinegar neutralizes baking soda into salt and water. Do you remember those science experiments in elementary science, e.g. the erupting volcano? That’s what happened. I suggest leaving out the vinegar and doubling the baking soda and tea tree oil. That’s what I did and it worked quite well. Hi Marlene. Sorry to hear that! Did you see my notes in the other comments about this? Did you shake it a lot? You need to gently stir, rather than shake. It can also depend on whether you follow the recipe to a T or adjust the measurements and how you add them together. I’ve made this 100 times and never had a curdling issue. I hope that helps and thanks for sharing your experience. I am making some orange cleaner (white vinegar and orange peels), could I use a little of that in place of the tea tree oil? I dont really like the smell of the tea tree oil, and was hoping this would add a little strength to the cleaner. I just tried to make this and what a mess! Followed the directions but when I added the white vinegar it foamed up all over my counter and floor. Hi Greta. Sorry to hear that! Did you see my notes in the other comments about this? Did you shake it a lot? You need to gently stir, rather than shake. I hope that helps and thanks for sharing your experience. I love your cleaning recipes. However I had 2 problems? Can you help me solve them? When I made the bathroom cleaner I found out that castle soap combined with vinegar just curdles. So I made the recipe again and used sal studs. Then when I added vinegar to the baking soda mixture it started foaming up. Also can this mixture be kept to use again & again until I need to make more? The spray nozzle has dried baking soda on it that I need to wash off before each use. Since this mixture has water how long will it last without a preservative? Or should I add a preservative? Hi, Kim: Did you see my notes in the other comments about castile soap and vinegar? If you don’t mix them directly (as in you add the water first) you shouldn’t have a problem with curdling. So sorry that you did–sals suds is a great alternative. Strange that the mixture foamed up though–did you shake it a lot? You need to gently stir, rather than shake. Let me know if that helps! I don’t add a preservative to mine and it lasts for months. Hope that helps! Thanks so much for sharing your experience. 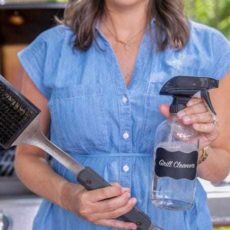 I’m so glad I came across this post because this is what I need to clean my bathroom, especially during the warm humid summer months! And castile soap is my favorite. I need to ditch the bleach! Will try this soon! Oh my gosh, I just found this recipe and I’m in love! I didn’t have unscented Castile soap but the peppermint scented worked fine. I also used sweet orange essential oil instead of tea tree and the smell was divine. I halved the recipe to make sure it worked, and boy did it! Seemed to cut through grime quickly and my house smells fresh, clean and non-chemical-ly. Definitely a keeper! Thank you. Ahh Gail, yes, I am so excited that you loved this recipe. It’s amazing how powerful natural cleaners can be, right?! Thanks for sharing! I make this same cleaner, only using Dawn instead of the castile soap. Hey Erica–Just watch out for Dawn, it contains lots of toxic chemicals, which is why I opt for castile soap. So is this fine for acrylic tubs? Yes, I believe it should be! I thought that mixing vinegar with Castile soap was a bad idea? I Just made this recipe and the soap curdled and if i dont have the spout closed it just sprays out.. AND it over flowed when I poured the vinegar into the water/castile soup mixture. I dont know what happened but it wasnt’ a success for me! Hi, Summit. I’m so sorry to hear about your experience. A couple questions for you: did you add the soap directly to the vinegar without any water? And did you shake the bottle? Hopefully we can get this figure out for you! I’ve never had an issue like this. I’ve never heard of Tea Tree Oil for this purpose. There are other home remedies that we do use it for, I’ll have to try this out. I just want to add something we’ve done in our home as well to reduce clean up. We have a special needs son and cleaning up after him can get pretty tiring. Out of necessity we’ve had to create what we call a Urifunnel. It’s a portable urinal for boys and men who need assistance, but also works great for potty training little boys as well. It helps prevent splashing and definitely reduces cleanup time. Thanks so much for writing in, Jorge. I hope you will experiment with tea tree oil–it’s such a great products for cleaning. And also for skin, particularly if you have acne. I’m glad you’ve found a helpful tool for your son, as well. Cheers! Yes have definitely used for skin!